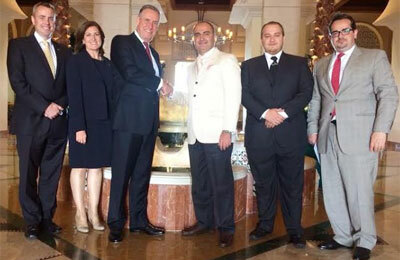 The agreement was signed by Michael Hobson, chief marketing officer, Mandarin Oriental Hotel Group and Basel Al Kasem, CEO, Al Basel Group. Alison Styles, vice-president Sales & Marketing EMEA and Adrian Hearn, regional director of Sales for the Middle West, both from Mandarin Oriental Hotel Group, also attended the event together with Omar Al Kasem, director of VIP accounts at Al Basel Group. According to Al Basel Consultancy, the tourism industry has seen a dramatic increase in international travel from both the Middle East and GCC region. With this new partnership, Al Basel Consultancy will work on promoting Mandarin Oriental’s unique services and facilities to high-profile travellers who expect high-quality standards and luxurious accommodation. “We have always admired Mandarin Oriental hotels for their design, their tranquillity and their sense of arrival. The feeling of relaxation is further heightened by the extraordinarily refined Asian hospitality delivered by the Group’s exceptional personnel,” said Basel Al Kasem. “We are delighted to partner with the Al Basel Consultancy group, which is a very well established company in the travel industry,” Hobson said.